I love cases, covers, and bags more than most people, but I require a lot from any case or cover. They can’t just look nice and offer protection. 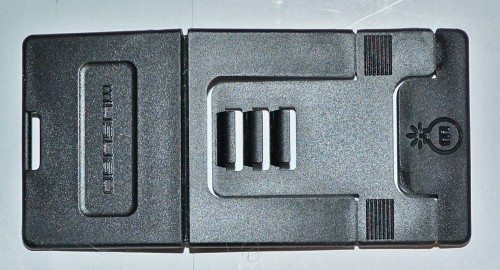 They have to also not detract from the looks of the gadget, and they need to either add no bulk or weight or have some fabulous feature that compensates for it. 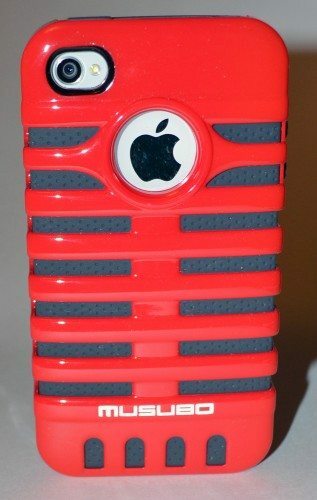 I’ve been very picky about cases for my iPhone 4. I’ve tried quite a few, but none of them compared to the Apple Bumper Case, which added a pop of color and some protection but not much else. 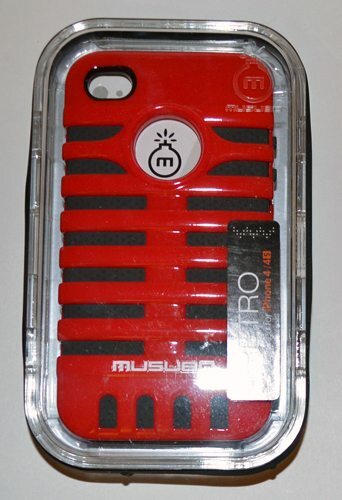 I thought it was my perfect case, until I saw the Retro iPhone 4/4S Case from Musubo. I was very happy to be selected to review the case and find out if it was more than just a pretty face. Click on any of the following images for an enlarged view. I have strange tastes. I like houses that look like they either grew out of the ground or were dropped here from outer space. That carries over into design for other objects, too. The Retro case falls into the “dropped here from outer space” category. It reminds me of the Streamline designs from the 1930s and 1940s. The Retro looks like it was inspired by the designs used for car radiator grills and even for microphones from the period. The case is compatible with iPhone 4 and 4S. It comes in black, blue, red, silver, white, and yellow. 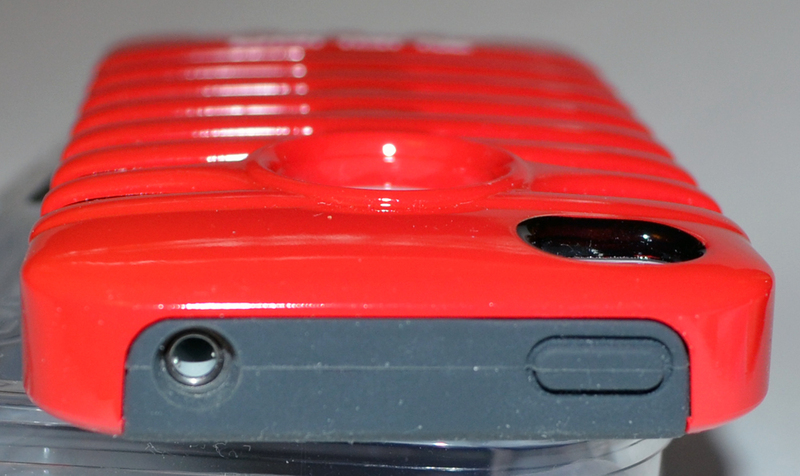 The Retro is a two part case, with a hard shell covering a silicone cover. The outer shell is made of polycarbonate. 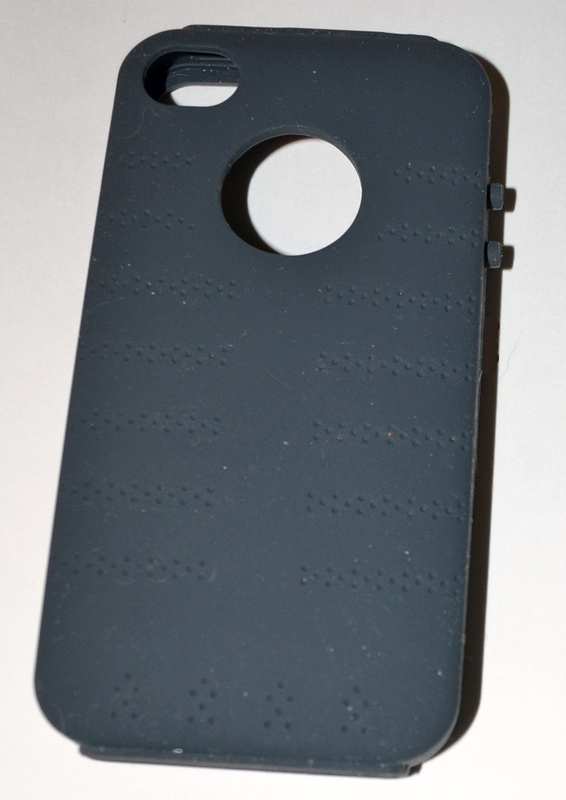 It has an open bottom and top, and one side has round holes for the volume buttons and an opening for the mute slider. The back has a opening for the camera lens and flash, and there’s a round hole in the middle that exposes the Apple logo on the back of the phone. 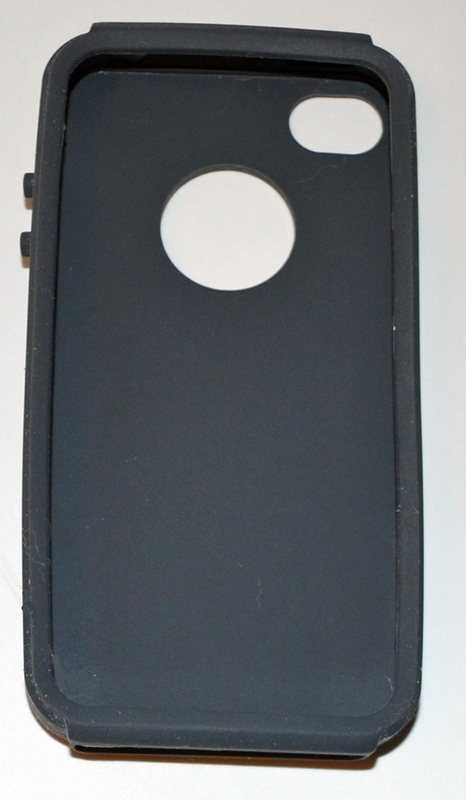 The silicone inner sleeve is the same dark gray for all shell colors. Visible between the ribs of the polycarbonate shell is a dotted pattern. There are openings for the camera and Apple logo on the back, and the bottom is open to expose the phone microphone, 30-pin connector, and the speaker. The side has an opening for the mute slider, and the top has an opening for the headphone. Both the volume buttons and the sleep/wake button have raised areas to cover them. You’ll notice from the pictures that the silicone is a bit of a dust magnet. The case weighs about 1.25 oz, compared to the 0.35 oz that my Apple Bumper weighs. It measures about 2.35″ wide X 4.65″ tall X 0.5″ thick, compared to 2.15″ X 4.35″ X 0.35″ for the naked iPhone 4. It does add noticeable bulk and weight to the iPhone. But that added bulk is compensated for by the beauty of this case. I absolutely love the way it looks. I like how the exposed Apple design looks like the logo badge for an old car, or something. And I love the rounded edges of the case; it feels comfortable in my hand. I like the way the silicone case wraps over onto the front to keep the screen lifted off the tabletop if I should lay it face down. It covers up almost all of the horizontal bezel (which is very narrow anyway), but leaves the Home button, phone speaker, ambient light/proximity sensor, and front facing camera fully exposed. 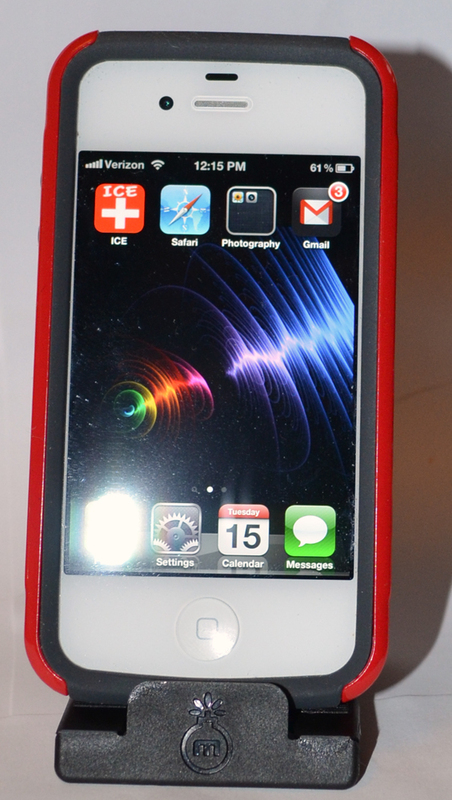 I find the three colors – red and gray of the case and the white bezel – very pleasing together. The covered volume buttons are easy to find and use. The mute button is recessed, but useable. You won’t accidentally set your phone on mute while it’s wearing the Retro case. I was easily able to use my headphones and my wired phone handset. The power button is easy to use. There is no opening for the top microphone. I tried making a voice memo, and my voice didn’t seem too muffled by the silicone. It’s easy to charge the phone using the charging cable, but I don’t think the Retro case will fit into most docks. The phone microphone and the external speaker are completely exposed, and the case doesn’t interfere with them at all. The one thing I don’t like is the bar of silicone that extends along the bottom of the screen. With nothing along the bottom to support it, this bar is easily stretched away from the phone. 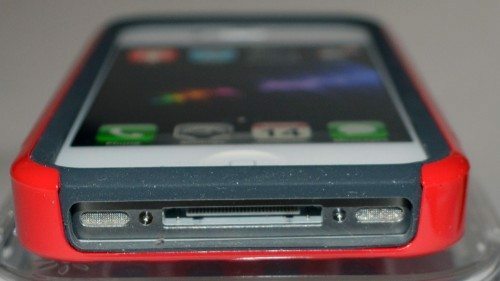 There’s no way the phone can fall out of the case, but the flimsiness bothers me. The Retro case comes with a fold-away stand. 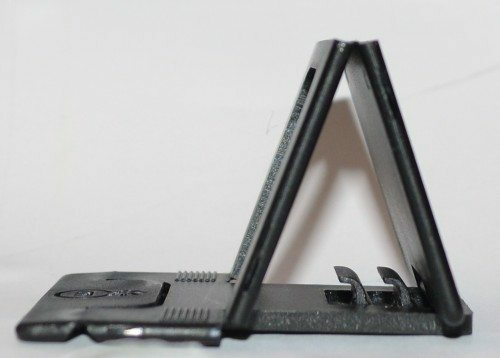 It’s made of black plastic, and it folds down to 2″ wide X 4.15″ long X 0.25″ thick. An oval opening on one end fits over one of the three hooks to fold the stand into an A-shape. The three hooks allow you to adjust the viewing angle. When in use, the flap (on the left, bottom photo) folds up to hold the iPhone on the stand. 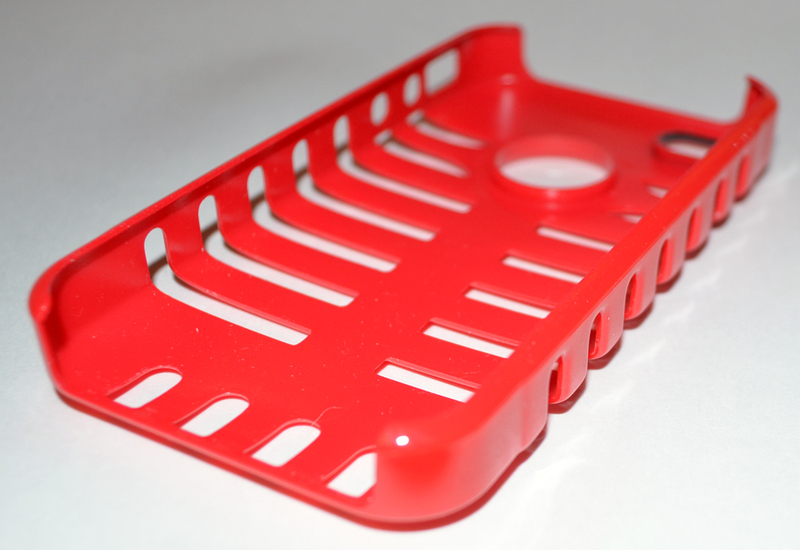 The stand holds the iPhone in either the vertical or horizontal orientation. You can see the front flap holding the phone in place in both of these photos. 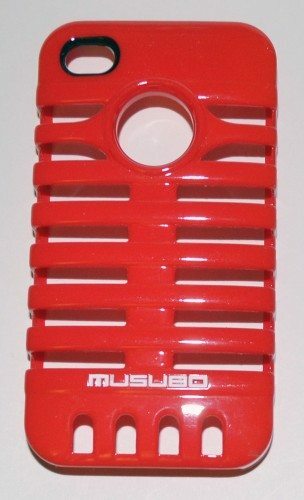 I absolutely love the Musubo Retro case. 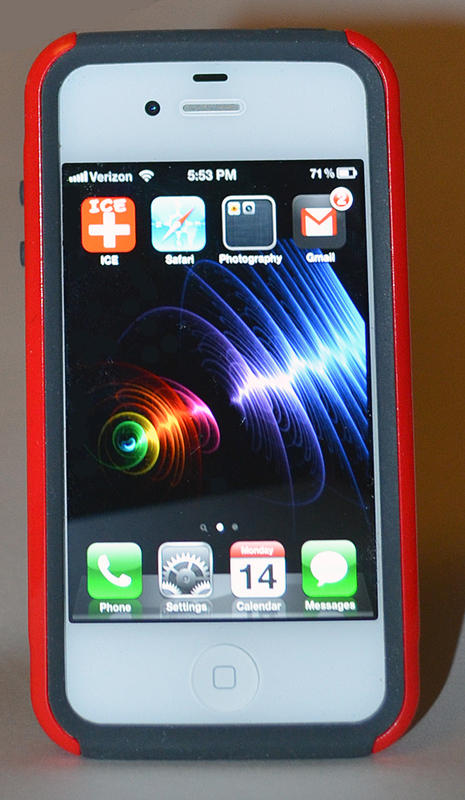 It’s been on my iPhone since I received it, and it has permanently replaced my Apple Bumper. It’s attractive, protective, and comfortable to hold. It adds some bulk and weight, but I don’t care because I love the way it looks. It’s often “monkey see, monkey do” in the Cloninger household, and I had to purchase Retro cases for both Butch and Rachel – blue and silver, respectively. 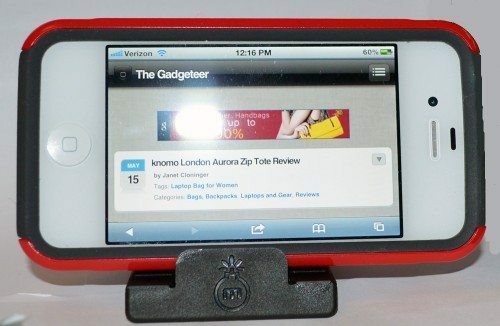 Musubo Retro Case for iPhone 4/4S Review originally appeared on The Gadgeteer on May 20, 2012 at 10:00 am.